Love from the Kitchen: Visiting London - For Less! Are the Olympics inspiring you to take a London vacation? We love visiting London, but it is quite expensive (the Brits might say "quite dear"). Today we would like to share our best tips on vacationing for less, and getting the most out of your stay. Best (cheapest) times to go are late fall and early spring. While the weather mostly likely won't be ideal (cold and wet) the flights/accommodations will be at their least expensive. And you aren't going to London for a beach vacation anyway. If you think you are, you have mixed up your travel books. One important thing to note in this strategy: not everything is open all year long, particularly some of the royal-related spots. For example, Buckingham Palace is only open to the public July - early October. If you really want to see something particular, you want to make certain that it will be open when you get there. This is an important one if you want to make the most of your time. Know the things that you want to see and the places you want to go. Find out where they are, when they are open and how much they cost. We made a website for our trip - http://london.zentmyer.us/ - with our itinerary, map, and all the places we planned to see. This helped us make sure that we got to see everything that we wanted to see, and kept us on schedule when we needed to be. We live in San Diego. When we went to London last year, we didn't have the option of a non-stop and took a flight that stopped in Minneapolis. That made about a 4 hour flight to MSP and then another 8 or so to get to Heathrow. This year, British Air started a non-stop flight out of San Diego to Heathrow, and it takes about 10 hours. A single 10 hour overnight flight gives you a much better opportunity to sleep, which will definitely help with jet-lag. And once you get there - if coming from most of the United States, sometime in the afternoon - you are best off staying awake until after dinner. Plan something for after you've checked into your flat or hotel. The London Eye is a great place to start your London vacation.... and it works if you are tired. Or take a walk around a nearby park. Have dinner at the Hard Rock. Then, head back home and enjoy an early night. You should be able to head off quite a bit of the jet-lag. You can find a number of different websites that will help you find a flat to rent. We've used findaflatinlondon.com and homeaway.com, but there are others out there. We had a great experience with our first flat. The owners were very friendly, easy to deal with from the US and easy to contact. The flat itself was clean, modern and well-furnished. And we had a great location. We loved having laundry - we just put the load in the washer/dryer unit when we left in the morning and it was done when we came back later in the day. Having the kitchen allowed us to have breakfast and occasionally dinner at the flat, which saved a lot. I'll let you know about the next flat when we return from our trip in October. The London Pass is a city sightseeing card which allows you free access to more than 55 attractions, and allows you to go the front of the queue in a number of different attractions. The London Pass can be purchased for 1, 2, 3 or 6 day periods. And here's where your research comes in to play. Take a look at the list of things you want to see and compare it to the list of attractions on the London Pass. You can figure out your savings to determine which of the alternatives is best for you. If you do get one, spend some time reviewing the list of attractions. We found some really interesting things on that list that we never would have done if we didn't have the Pass. Many London museums and attractions are free. Free! The British Museum is one of the best museums in the world. Free. If you go (and you definitely should go), take some of the short guided tours. They are given by Blue Badge Guides (certified tour guides) and really add a lot to your experience. Did you know that you can visit the Houses of Parliament? And that it is free? Certainly one of the most popular tourist spots in London is Westminster Abbey. And rightly so. The Abbey is incredibly rich in history, and a sight not to be missed. 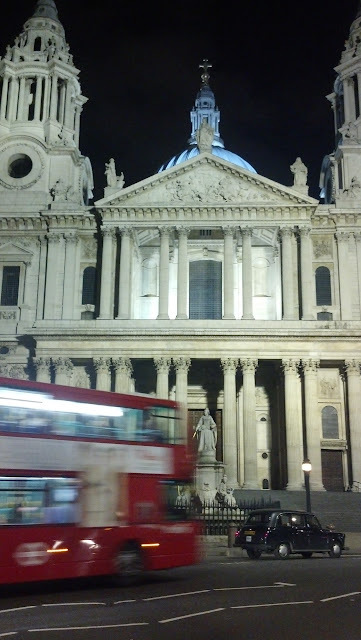 St. Paul's Cathedral is also right up there in terms of history and architectural beauty. And the views from the top are breathtaking! If you happen to be visiting on a Sunday, get up early and go to the 8:00 AM services at Westminster or St. Paul's. In fact, stay for two Sundays and go to both. Free (which is nice as both the Abbey and St. Paul's charge an entry fee when not attending services)! And don't forget to take in the many parks in the city. Walk along the River Thames and cross the famous bridges. This is a great way to enjoy London! Another great evening activity is the London Walks. London Walks puts on reasonably inexpensive walking tours of London, with many different themes. And many are held in the evening! We did a Harry Potter tour, Westminster by Gaslight, Jack the Ripper's London, and the Ancient City at Night. Wonderful way to see the city! And, London Walks gives a discount to folks with the London Pass. London has great public transportation. Best transportation for distances of a half mile or so? Walking! Walking (1) is free, (2) allows you to see things as you go from place to place, and (3) is fastest. When walking isn't an option, consider the bus. The bus is the cheapest form of public transport and you can get a bit of a free tour as you go. It is probably also fastest for trips of up to about 3 miles. The London Underground (known as the tube) is a great option for other trips. It is quite easy to navigate, quite clean and safe. You may find it quite crowded if you are travelling at rush hours, and people move quickly. And the tube is more expensive than the bus. Be sure to mind the gap between the train and the platform when you ride! If you plan to be in the city for more than a couple of days, consider getting an Oyster card, which is a re-loadable card for use on the London public transport. This will save you time. Plus, you will look like one of the cool kids if you keep your card in its flap and wave it over the sensor. The cheapest places to eat are generally pubs. And they have great food! Often free wi-fi too. Breakfast at your flat is a quick and inexpensive option too. Do splurge on a good English High Tea - it is worth the experience! Hopefully this gives you a few ideas for your London vacation. We'd be happy to answer any questions you might have. We're planning a trip in October and we will be taking my Mom who uses a wheelchair, so we are doing our research on accessibility as well. If you've got suggestions for me, leave a comment or send me an email.